The Shemagh or kafiya is a traditional Middle Eastern head wrap thought to have been developed from the Arabic turban. Its primary purpose is to protect the wearer's head, face, eyes, and neck from the elements, including the sun, wind, dust, and sand. It can also be worn around the neck as a scarf, and lately has become a popular fashion accessory. 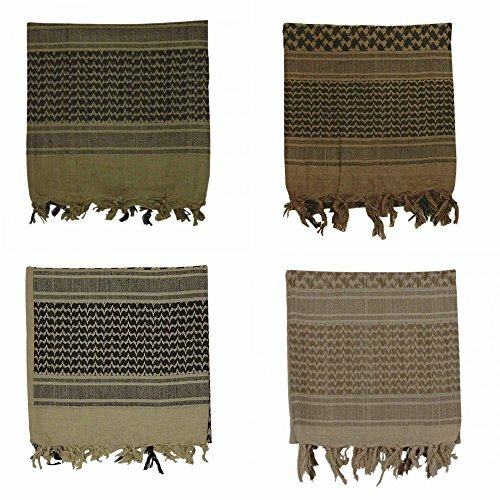 Adopted by the British Special Air Service (SAS) personnel during World War II, the woven cotton scarves are popular today with our war fighters in the Middle East and Afghanistan. All of our shemaghs are 100% cotton and the colors are woven in as opposed to printed on the surface as is the case with some cheaper (and inferior) products. Approximately 42"x42".